Father’s Day is quickly approaching and one thing I know about most dads is they like a good meal. As the person making the meal I like it to be an easy healthy gluten free recipe. This recipe is sure to please both plus it’s also dairy free. First it has sausage and potatoes which I know is a favorite of many guys. For those making the dish you can have the base created, store it in the refrigerator overnight and when it’s time to serve finish up the topping and it’s good to go. Now you might be asking how is sausage and potatoes healthy. First let me say anytime you are into your kitchen cooking from whole ingredients where you can have control over what goes into your food, well you’re going to eat a lot more healthy than just opening a box of something. Now potatoes, especially organic potatoes, provide a good source of Vitamin C, B6 and Potassium without the pesticides. As for the sausage, we’ll just keep the portions of that to a respectable size of two links for the entire pie which makes 16 slices. If you like you can always swap out mushrooms for the sausage. Of course if you eat the entire pie yourself, well then you’re on your own. Another way to keep the sausage more to your liking with less fat and filler than the best thing to do is make your own. I have a few recipes on this site but you might want to use the Sweet Italian Sausage recipe. When serving this pie I suggest a nice big green leafy salad with a simple Easy Healthy Gluten Free Salad Dressing. With this recipe, as with any of my recipes I like to give you options so please read all the way through the recipe. If you create more options I’d love to hear them so please share. To keep this recipe vegetarian/vegan substitute mushrooms for the sausage and add a little oil to the pan when cooking them. If you don’t like or have Italian Sausage use whatever you like most or have on hand. 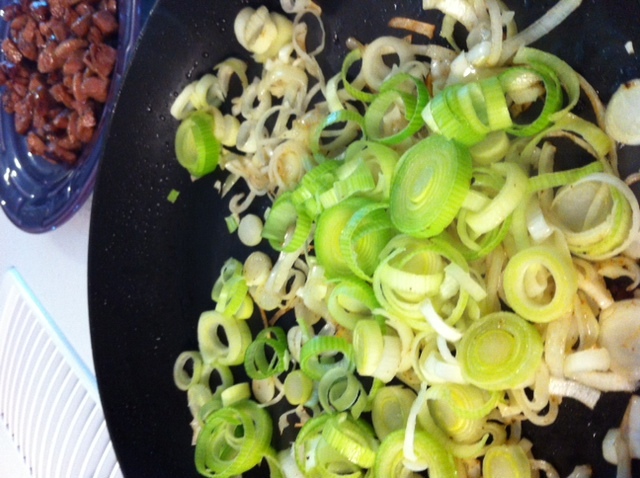 If you don’t have leeks use whatever onions you have on hand. If you want to keep this Paleo/Primal substitute sweet potatoes and make sure your crust is made from almonds instead of grains. If you are baking your own crust you should do this first. I made a modified version of Elana’s Pantry tart crust using bacon drippings instead of grape seed oil, which made a flaky and tasty gluten free crust for this pie. Next you will want to make the mashed potato filling for the pie. 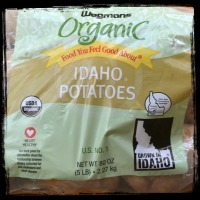 Peel and slice your Organic Idaho® Potatoes into roughly the same size pieces. Place into a large pot of cold filtered water with a pinch of salt. Turn the heat on high and bring to a boil. Let the potatoes boil until they are soft which should take anywhere from 15-25 minutes. Once the potatoes are cooked drain them and put the pot back on to the stove making sure the stovetop is off. Add in the milk and butter into the pot so they can begin to melt and warm. Add the potatoes into the pot by pressing them through a potato ricer. This will create the creamiest and most delicious potato mixture ever. If you don’t have a potato ricer you can use a potato masher. This way may have lumps but that will just make this pie more rustic. Taste and adjust the salt, milk and butter to your liking. Add the Organic Idaho® Potatoes to the crust until almost to the top leaving some crust showing so you can add the toppings. Time Saving Tip: At this point you can cover and place it into the refrigerator to be finished when ready to serve that day or the following day. If you do this simply place the pie into a 350° F preheated oven for 15 minutes to warm through. While the pie is reheating dice the two links of sausage and toss them into a preheated skillet on medium high. Let them rest in the pan so it will release their flavoring. Once it has browned you can move the sausage around the pan and brown on all sides then remove from the pan but leave the oil. As the sausage is cooking prepare your leeks. Cut the large green top off and the bottom root. Slice the leek and separate them into a colander. Run water through them to make sure you get any extra dirt and sand removed. Shake off the water or even dry with a paper towel before tossing them into the same skillet that you cooked the sausage in. 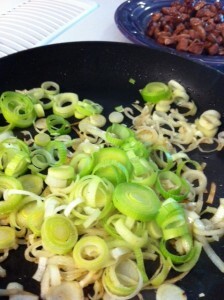 Now let the leeks absorb the flavor left from the sausage and begin to brown and caramelize. 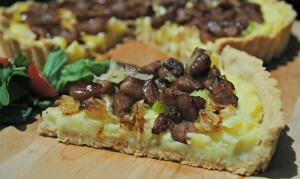 To finish the pie, sprinkle the leeks over the top of the pie and then the sausage using as much topping as you like. Return the pie to the 350° F preheated oven for 10 – 12 more minutes. When the pie is finished, slice into 16 pieces and serve with a side salad. Tip: You will most likely have extra mashed potatoes that will not fit into the pie. This is always a good thing in our house. If you are making this the night before you can serve the extra for dinner. You can save the extra for lunch and fry them up into potato patties. Disclosure: I was compensated for creating a recipe for the Idaho® Potato Commission. All opinions shared are my own. You can also view this recipe on the Idaho® Potato Blog. oh boy that does sound ((and look)) delicious! thanks for sharing! Thank you? What's on your menu? This looks awesome! Thanks so much for always sharing the good stuff, Diane! Thank you Shirley. You know how I love my potatoes.